Kindle daily deal 19Aug16 Amazon $0.99. I really liked this otherworldly series with ghosts.3.5 Stars“Never bargain with the dead. We have nothing to lose.”I liked the Kingdom well enough, but something was missing for me, it was John Devlin. The forbidden romance of the original Graveyard Queen was like a gaping hole that needed to be filled. Thane was an interesting character but I missed the haunted detective and wanted Amelia to get back to Charleston so that we could explore that story line more.The Prophet picks back up on the story lines from the Graveyard Queen with Devlin who is haunted by his dead wife and child. Amelia has avoided him, hoping that she could forget about the detective, but he haunts her dreams and his dead partner Robert Fremont has worked his way into Amelia’s life and wants a favor from her. Robert Fremont needs Amelia’s help to find his killer so he can move on, he claims the time is right now everything has aligned and all the players are now in place for him to have a chance to move onto the other side.Everything is lining up and there are synchronicities leading Amelia down a path she can’t deny. A path that includes John Devlin, but is he ready to admit he is haunted and even if he does will he decide to choose the living or the dead?“What is it about the house that frightens you? What is it about me?”My gaze went past him to the house. I could see Shani in the window and Maiama hovering in the doorway. Maybe it was my imagination, but I thought I saw the glimmer of faces in every other window. “You know why,” I said breathlessly.“What are you talking about?”“You know, John. You just refuse to admit it.”The first 50% of this book moved really slowly. Amelia was doing everything she could to avoid certain characters and deny her feelings. It got a little tedious for me and the only parts I really liked were her interactions with Shani, Devlin’s dead daughter who also wants her help to move on. There is a departure from the original storyline into a slightly sinister use of Grey Dust and some African hoodoo voodoo type magic. It was a little distracting but fell into Mariama’s past and the discoveries of why Robert Fremont might have become a target. Thankfully at about that 50% mark things started to pick up considerably. People actually had heartfelt conversations and worked out a few things. While I was slightly bored with the first half, I was totally riveted by the second and couldn’t wait to see how things worked out. FINALLY Amelia and John talked and I loved all of their page time together.“That’s because I’m haunted.” “What haunts you?” he asked softly. “You do.” So many revelations were made and it really took off and snowballed that last half. If I were to rate the book solely on that it would be 4.5 but the first half was only a 2 for me. I hope in the next book we get a better idea of what Amelia can really do with her power and if/what the consequences of her actions in this book really entail. The slow southern role of this book still catches me and I love the imagery and romanticism of this haunted story. 3.5 STARSI need The Visitor ASAP. Sadly, this book totally didn't work for me. I loved the first two books in this series, they were eerie and haunting and a lot of fun, but this one just fell apart in almost every way for me.It started out weird that instead of being absolutely horrified by what she found out about her past in Asher Falls, Amelia was somehow inspired by it. She always felt like a loner but now she says knows why she is the way she is so its OK. But it's horrible, it's not just a family trait she got from her "Papa," the circumstances of her birth should put anyone in therapy. She wants to believe it's a gift, not just a dangerous legacy. Fine, if that keeps her sane. But it's really glossing over the whole heart of the last book, which was disappointing to me, I wanted to see it addressed. Amelia refers to the guy in book 2 a lot but not the big news of how awful her background is. Instead she's just mooning after Devlin. It was just bizarre to me that she never once mentioned the horrible things she found out. It should have profoundly changed her. And then there's that whole big secret I just can't tell you trope. Whether they can't tell for someone's own good or they think they'll never be believed, it always gets carried too far in every book it's used in and it's so annoying. If Amelia can't have a relationship with Devlin anyway, why not risk telling him and taking a chance that he'll be able to use the knowledge to get over what he's been clinging to for so long? Worst case is that he doesn't believe her and they have no relationship, status quo. One thing that really bugged me was the big use of coincidence in this book. Amelia kept "just having a strong feeling" and there are lots of coincidences that she thought were suspicious but chalked up to fate because nothing is really a coincidence. She keeps repeating that she no longer believes in randomness, everything happens for a reason, but the reason is the author, it's all too convenient, it felt lazy and just irritated the heck out of me. Plus Amelia repeatedly said that something or someone was trying to direct her actions, and that took away from her intelligence and free will and spirit. she ended up looking weak and silly. And what was with that mystery powder? How many times was Amelia sneaking around where she didn't belong and got some mysterious powder blown on her and then bad stuff happened to her? It was totally overused, it made her look like an idiot cozy mystery snoop who just should have stayed home, and made me wonder why the author couldn't come up with a few different ways for the girl to get in trouble this time around. I think what bugged me the most is that it felt like Amelia was being victimized. In the other books there were human villains of course, but the supernatural elements were really strong and so surreal that they took center stage. But now clearly Amelia was being hunted by a human. This wasn't about ghosts, although a lot of ghosts certainly had their hands in the puzzle and had stakes in the outcome. And even though Shani was still intriguing, she wasn't scary anymore, she was just sympathetic and sad. And Mariama was pathetic and a villain but since she was clearly Amelia's opposition she wasn't wasn't really scary. And Fremont didn't present as scary. So even if Goodwine was scary, it was a human scary, manipulative and evil but not eerie the way a cemetery full of drowned ghosts ringing bells and reaching out for Amelia in the night were eerie in Asher Falls. Plus I hated the romance. She doesn't know this guy. Everyone, including the guy, kept telling her that she doesn't know this guy. She has never had a real conversation with him, hasn't seen him in months. This isn't love. I had high hopes after the first book that this was a relationship that was going to develop slowly and have some depth, but it's still insta-love all attraction no interaction. Reading about an otherwise mature woman moping around after a guy like a teenager wasn't fun. I have to give the author a lot of credit for one thing, she wasn't one of those authors who had the character have a dog or car and then just forget about them. Amelia adopted a fabulous dog in book 2 and she took good care of him. She remembered to let him out and walk him even when it wasn't just a key part of the plot. He was there in the house with her, responding to whatever went on. A lot of authors like having their characters have a pet but then forget that if their character is out all night or the house gets trashed, what happens to the animal has to be addressed, the fans are attached to the pet and will notice. But of course it has to be done without being obsessive too, no one wants to read about every potty break, just like we don't want to read about every shower or cup of coffee or bite to eat like some books seem to detail. Providing realism is a balancing act that Stevens manages really well. The whole tone of the book was just off for me. It wasn't spooky or eerie or particularly interesting, I didn't like the romance, I didn't like the coincidence-filled cozy mystery and half way through I was bored and didn't even want to pick it back up. It was a very unexpected total turn-around from the first two books, which I really enjoyed. Realmente un 4.5Aunque esta tercera parte me ha encantado, no ha conseguido atraparme tanto como el primer y segundo libro. La historia en sí está bien, muy bien, pero la relación entre Devlin y Amelia me ha parecido un tanto floja: en ningún momento he sentido ese amor prohibido, esa necesidad de estar juntos o atracción entre ellos. Es por eso que no puedo ponerle las cinco estrellas. Love all the revelations! The romance between Devlin and Amelia finally feels mutual! Can't wait for the next one! Audio narration is wonderful. Realmente me encanta esta autora y sus libros sobre Amelia Grey. Esta tercera entrega cumple las expectativas porque, además de un relato tan sobrecogedor como los dos anteriores, nos entrega una resolución muy cuidada, emotiva e inesperada a todos los misterios que se vienen arrastrando desde la primera novela. Sin embargo, en sus últimas páginas aparecen nuevos componentes, por lo que no me extrañaría que pronto pudiéramos disfrutar de un nuevo libro sobre la Reina del Cementerio. And Then the Prophet Appeared from behind the veil Would his words by lies or truths? As Darkness falls once again and the veil lifts to free the unrest Amanda Stevens brings us back to the beginning, to the sultry Charleston where it all begin. Things comes full circle for Amelia when the ghost of Robert Fremont also known as the Prophet, asks for her help. Amelia has to sort out alot of facts along the way uncovers some things that have been left hanging from the first book.Added to the mix is the relationship between Amelia and Devlin and the ghosts that still haunt Devlin.Stevens still sends chills down the readers spines with some very suspenseful and downright creepy moments. "My gaze was riveted to the windows where a message began to appear. Not a heart this time. Not a request or plea but a bold, angry demand that repeated over and over in the frost: HELP ME HELP ME HELP ME HELP ME HELP ME HELP ME HELP ME" But always the main draw has always been Amelia and Devlin and we readers finally get a sort of closure between them. There's always a gothic feel of the romance between the two is so strong and at times tragic because of all that sometimes stands between them. Yet, their love finally overcomes the darkness, but there's still a darkness that that looms over the couple. This is where the Prophet has a whole starts to lose some of it's shine, but also left the reader a little leery of what happen to the Kingdom. If you read the whole series, the Kingdom almost felt like a filler book and really didn't need to be read. I found this sad, as everything that happen in the Kingdom almost felt like a step back for all the characters and the plot when it came to the Prophet.At the time it was only known that there would be only three books in the series, thankfully Stevens has more books up her sleeve, and it made some sense as to why things were left still a little hazy at the end.Stevens still showcases her amazing talent and the gothic beauty of this amazing series, I still can't get enough of. Warning! 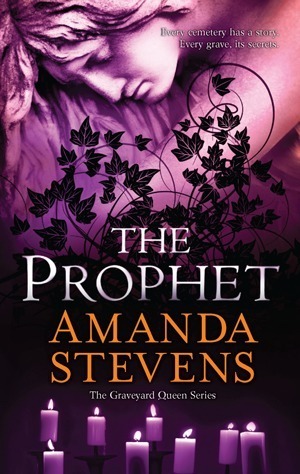 Do not read this book if you are home alone!The Prophet by Amanda Stevens is the third book in The Graveyard Queen series. This book finds our heroine Amelia Gray back in Charleston, S.C. after some time away at Asher Falls (The Kingdom). Amelia is glad to be home, but she was deeply affected by the events at Asher Falls. She desperately misses someone from that town, yet she still pines for John Devlin, a haunted man.Amelia can see ghosts. These ghosts are dangerous; they can drain the life out of the living. Amelia has always lived by her father’s simple rules – never acknowledge the dead – but lately, she has allowed the ghosts to know that she can see them. When Amelia is approached by the powerful ghost of Robert Fremont, she agrees to help him find his killer. Robert is a strong ghost in that he can manifest in Amelia’s safe haven, hallowed ground. He is also able to manifest in the daytime. Amelia’s investigation of Robert’s death takes her through all sorts of dangerous situations.Devlin is still haunted by the ghost of his wife Mariama and her young daughter Shani. Mariama’s power makes her a formidable ghost, nothing to mess around with. The Prophet also introduces Darius Goodwine, Mariama’s cousin. Darius is behind many strange events in the area. Darius had been in Africa studying how to be a root doctor. His type of sorcery was frightening running the gamut of sound, control, dream infiltration, and the ability to cause people to become his zombies with gray dust. Darius adds a lot of creepy scary to this book. There are some interesting revelations in this book, especially about Mariama. We learn more about Devlin’s relationship with Mariama, her manipulations and plots. Mariama’s on again/off again relationship also focused on keeping Devlin’s daughter from him. Of course there are some jaw-dropping moments…Amelia’s relationship with Devlin goes through the wringer in this book. He warns her to stay away from him. She is drawn to him and cannot stay away.No one writes ghost stories like Amanda Stevens. The prose is beautifully written, haunting, evoking all the senses. The descriptions are vivid, the atmosphere dark and somber. The author has fantastic story telling skills. This is not just a ghost story; it is also a murder mystery. I understand that there will be more books in the series. Bring them on, I can’t wait.Thank you to NetGalley and Harlequin for a review copy of this book.Review posted on Badass Book Reviews. Amelia was back in Charleston, and I was very happy about it. Although this is the third book in the series, it’s a continuation of the first book, which really makes the second book feel out of place. The ghosts in Charleston would not leave Amelia alone, and they were becoming more dangerous. Amelia was trying to avoid Devlin but the ghosts were drawing them together.Up to this point, this is the best book in the series. With each book the stories get progressively creepier. The mystery was really good. I’m more curious than ever about the Coffin and Claw and what they do. I’m very interested in learning more about Darius Goodwine. Amelia and Devlin were getting closer, but his ghosts were keeping them apart. Mariama is fascinating and loathsome all at the same time. That was one hell of an ending! What will the consequences of it be? *SOME SPOILERS*The eye rolling moments continued as Amelia kept up with her TSTL actions. The mystery was still there and it kept me going but I could not ignore Amelia's grating personality, her annoying, repetitive inner dialogues, and her inactions when it mattered. Devlin's character, who I had found captivating and alluring in the first book, turned out flat and unappealing in The Prophet. I kept wishing that Thane would make an appearance. It made me wonder again what was the point of The Kingdom. I think the series would benefit better if the events of The Prophet had occurred prior to the ones in The Kingdom.Amelia's obsession with Devlin turned her into an insecure woman who acted more like a doormat. Also, the explanation given by Amanda to justify the relationship between Devlin and Isabel was flaky, it read more like an afterthought and still didn't justify the intimacy between them.The ending wrapped up the storyline but it was not as satisfying as I thought it should be. It was rushed. Devlin never found out the truth about Shani's death and by the way Amelia was behaving, I doubt that she would ever tell him. I understand that there were some questions left answered because there will be more books coming but I don't think I will be reading them.What a disappointing ending to a good series! THE PROPHET is the third installment in the spooky Graveyard Queen series. This time around, Amelia is back in Charleston and haunted by the ghost of a murdered police officer. He needs answers, and Amelia won't find any peace until he gets his way. The mystery was good, though the pacing dragged a bit in places.The second book in this series, THE KINGDOM, was my absolute favorite, and THE PROPHET had a hard time measuring up. I'm kinda done with Amelia pining over John Devlin. He needs to go, so she can get back to restoring cemeteries (the coolest job!) and developing her unique abilities. She needs her confidence back! While I did enjoy the surprising twists revealed at the end, overall I thought this one was just okay. This is a Quickie Review. For the full review, please visit The RomanceaholicExpected Release Date: April 24, 2012Publisher: HarlequinImprint: MiraAuthor’s Website: amandastevens.comMy Source for This Book: NetgalleyPart of a Series: Yes, Book 3, Graveyard QueenSeries Best Read In Order: YesSteam Level: SteamyWhile I do feel that the Graveyard Queen series is best read in order, I’m not sure how much of that stems from my immense enjoyment of the series and how much of it is really the feeling that new readers wouldn’t quite “get” it. While old fans of the series will relish the plotline deeply involving not only John but also both his ghosts and his history, I do think newcomers will be able to easily follow along, though of course they won’t get the benefit of having witnessed the developments in both John and Amelia’s lives.As a very solid member of Team Devlin, this book absolutely thrilled me. Not only was there the same arcane mystery, complete with plenty of twits and red herrings, as I’ve come to love from this series, but Devlin played an enormous part in the story — possibly even moreso than in The Restorer if that’s possible.The final chapters of this book left me breathless, and I’m anxiously awaiting future installments in the Graveyard Queen Series.A very solid 5/5 Stars. Well, after three books, Amelia never did grow on me. Her voice is still stilted and over-dramatic, and she still occasionally falls into too-stupid-to-live. She's "powerful," but I still don't know why. Devlin is still completely cardboard, and completely lacking in the charm other reviewers seem to have found. The mystery here is allll over the place, with a zillion characters (some new ones, too, because there weren't enough before? ), many which serve plainly as deus ex machina. Still scratching my head, trying to figure out what the point of The Kingdom was; this really read like that entire book could've been skipped, having practically no bearing whatsoever on anything that happened in The Prophet. I'm flip flopping between a 3 1/2 and a 4 star rating with this one.Amelia got on my nerves with her whiny attitude when it came to Devlin and her childish ways of ducking behind bushes and the stalking kinda kills the mood.The story seemed to go all over the place but if you read on to the last 80-90% things move fast and everything is revealed! But...then the story ends too quickly and too easily with still too many questions left that will you pondering.Book #4 can't come soon enough! I loved the first two books in The Graveyard Queen series. I think the second was my favorite though. The horror of Asher Falls... this one just can't compare to that.They had to bring that whole Devlin, Robert, Mariama, and daughter thing back. I didn't like Devlin in book one and liked him even less this time. And Amelia Gray...why oh why, do you want a man, pine for him even, when he was just nuzzling some other woman's neck? What the hell is wrong with you, girl?The entire novel was Amelia making one bad choice after another (You left the gun there?? Duh! ), having drug induced hallucinations, talking to ghosts, and stalking Devlin as she tries to find out who killed Robert, another ghost from book one.What was Asher Falls for???? Just to make her a more haunted woman in this book? Hm... Something isn't panning out here.However, the book didn't totally bomb. The beetles.. OMG. That was scary. The cowering under a desk next to a dead body... creepy stuff.In the end, however, I was displeased with Amelia and her blasted Devlin obsession. I think she needs to go back to Asher Falls. It also raised more questions, namely, for me, is Amelia alive or dead? 4.5This is a toughy. The reason being I loved the creepiness and structure of the last 2 so much, I was expecting the same to continue so I considered rating down . You know what ? Stuff it. Im not going to penalise her for having amazing books preceeding. This is a book where some stuff is revealed, while leaving other questions unanswered. The mystery in this one was not as smooth. But...I couldnt put it down, it was a page turner and sped through it. A sign of a 5 star book. After loving the second book I was very much looking forward to reading this third book. I am sorry to say that I am quite disappointed with this installment. It isn’t a bad book but I got annoyed with certain aspects. But not enough to want to stop reading the series.In this book Amelia returns back to Charleston and we even briefly return back to the graveyard Amelia started restoring in the first book. And of course Devlin comes back into this book. I noticed in the second book how I liked that he wasn’t as present. But he is in this book as was expected. On the one hand I do like that they have such a strong connection to each other and Amanda Stevens knows how to make it a bit steamy. But I find the constant focus on him very annoying. There is so much to Amelia’s abilities and the possibilities with the plot, but everything keeps coming back to Devlin.I think that is also why I feel disappointed in this third installment. I feel that the plot is lacking. Especially in the first half not a lot happens and it is mostly all about Devlin. The second half is stronger because there are a lot more discoveries, but even so I find that a lot more could have been done with the plot. There is a part where she is out to discover who killed a cop and of course this ties into Devlin’s past and ghosts. It went very fast over into Devlin and the dead cop fell away a bit too much for me even though that is where it started. It all just felt a little lackluster for me compared to the previous two. But I do like that Devlin’s ghost aren’t being prolonged over several more books.Also the tie into magic with the grey dust and the person getting into her dreams feel more like they are a set up to Amelia discovering more about her abilities. Like we are heading into a different area. And there is a tie into another culture which is always to be applauded. However I couldn’t help but wonder as I was reading this how poc would feel about the representation on this. I felt they were so easily pushed into the villain role and into the stereotype like Mariama as the woman who drove every guy crazy, promiscuous, jealous etc. But I also feel I am not the right person to judge it.And there were other things that stood out to me. How Amelia always compared herself to every other woman in this book. Every other woman was beautiful while she was plain. She seemed to have made a friend at the start but this person easily falls of the page when they have served their use for the plot. Or how her mother was ill in the second book but hardly mentioned in this one.So yes I had high expectations and this book fell short. I’m still interested in reading the rest of the series though. I hope this is just a one off in between book and that in the next one we are diving right into her abilities. The Prophet4.5 StarsThe Prophet is book #3 but it continues from where book #1, The Restorer, left off in terms of Amelia's relationship with Devlin and the issues surrounding the deaths of his wife and daughter.Although Amelia is an engaging heroine, she has an annoying tendency toward TSTL behavior, particularly in this book. She constantly ignores her instincts and finds herself in precarious situations and the only explanation is that her actions are necessary for the story to progress as they ultimately lead to a revelation of some kind. Devlin is as dark and tortured as ever. The fact that he is not in book two (although there are many references to him and Amelia's feelings for him), only enhances the anticipation and makes his return all the more worthwhile. The connection between Amelia and Devlin is breathtaking in its intensity and despite some questionable moments, the reader's patience is rewarded once they take it to the next level. The story involving Amelia's investigation into the death of a murdered cop and her attempts to help Devlin's daughter is absorbing, and Stevens is very skilled at concealing the clues to unraveling the mystery within the seemingly mundane. As a result, a character that aroused my suspicions in book #1 (and turned out not to be the killer) ended up being the culprit in this book. It is rewarding to know that my suspicions were justified even if it was not in the right book. The references to voodoo, black magic and the menacing villain all add an additional sinister layer to the creepy tone and eerie atmosphere of the Southern gothic setting. Nevertheless, the ending is a bit rushed although the mystery is neatly solved and well explained. Some tantalizing questions remain unanswered such as (view spoiler)[is Mariama truly gone? Will Devlin learn of her treachery? Did Amelia or Devlin bring something back with them from the other side? What is Darius Goodwin's endgame? (hide spoiler)]In sum, an exciting addition and I look forward to finding out where Amelia's abilities take her. This was 3.5 stars for me. I find this one a bit hard to review. I love the series overall and it has kept me engaged the entire time. I love ghost stories that have a touch of romance in them and this works in that regard. But it started to go off the rails about halfway through. I love Devlin’s character, but I didn’t love him for most of this book. The reasons were as readers we weren’t in his head enough to know what he was doing or why he was doing what he was doing. He also never explained his relationship with Isabel to Amelia, not a word. Isabel threatened Amelia if Devlin ever go hurt, but then said that they were just friends, but Devlin never said anything. Also he told Amelia not to contact him for a while in any fashion that he would contact her because he was working on something. He never came back and clued us in to what he was working on exactly. But every time Amelia got into trouble she was call Devlin and he would be there in 5 minutes. Then Amelia had been told to stay away from Darius because of how dangerous he was, but then he would walk right up to and blow stuff in her face and she would be right back in his clutches. Also we never knew who sent the email and text to Amelia from Devlin in the second book. At least if it was told I never caught it. The ending was too fast and I still don’t know if we had a HEA or HFN, love wasn’t really mentioned as much as it was implied…sorta. On the other hand that was a neat, sad little twist in the end about Shani that I didn’t see coming and was pleasantly surprised about. Now I know that there are more books coming and I hope we continue to get some closure for some threads that were left open, IMO. I do love the Graveyard Queen series and love how AS tells a good ghost story, but I just didn’t love this book. I loved the first book, didn't really like the second book, but was hoping this one would be better. It wasn't. I didn't feel as invested in the characters and the plot as I did in the first one. I was hoping the second was just a fluke, but maybe the first one was. Devlin was back, but he isn't the same as the first book. Amelia is more whiny and says how she needs to follow her father's rules but then ignores them. She does this so much it makes me wonder why she even bothers bringing them up. I found myself once again skimming paragraphs because she went on and on about her feelings about how torn she was and regretted being with a haunted person but every turn when she could have did things differently she went right back to the haunted man. I thought from the first book that she would be a strong woman who has had to get that way because of her ability and knows how to stand up for herself, but in this book and the last book she seems too indecisive. The ending, which I had been looking forward to since it could have went a few different ways, was rushed and unexplained. To say it left a lot to be desired would be an understatement. It kind of left an opening for another book, but I am still on the fence if I would bother. The love of the first book spurred me to read the other two, but I don't know if it can push me through a fourth. The last novel of The Graveyard Queen is very slow, too full of ghosts, and woo-woo. It's so irrational and flat that I didn't realise there was a story going on. Not enough action, too much talk or thinking. Though the previous books dealt too with paranormal, there's an abrupt change of tone here. It sound less serious. It was too surreal, and crazy at times, so I got confused and bored. I felt like Amanda Stevens didn't know where she was heading. The relation between Amelia and Devlin is still complicated, and strange. I didn't feel the connection between them. They're supposed to be in love, but never spend much time together or know much about each other. They're complete strangers, so the intensity of their bond is disturbing. Also I wasn't touch by the tragic aspect. I mean it sad for Shani, the victim and key of the mystery, but she's more scary than cute, and Devlin appears to be too dense, not very smart and the biggest deceived husband. Pathetic. For me it was not the best novel writen by Stevens. I was glad to have some answers but it was really not worth it, and I was not satisfied. Too bad, the idea and the atmosphere were good but she spoiled them.